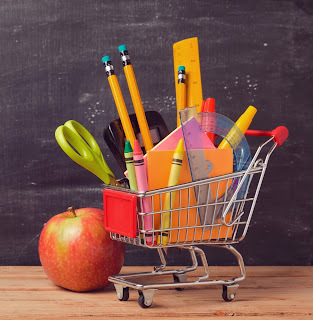 Community Financial Money Matter$ Blog: Have You Made Your Back to School Budget Yet? Have You Made Your Back to School Budget Yet? Everyone knows that the month of August brings the end of summer and the inevitable start of a new school year. Many parents dread the annual back to school shopping trip, but it doesn’t have to be a daunting task. Arming yourself with these few tips can keep you from feeling overwhelmed and help you avoid unnecessary spending. Even though the start of school is a whole month away, it’s important to start planning now. This can mean setting money aside for the big shopping trip, spacing the kids shopping trips over the span of a few weeks or planning ahead for your own monthly expenses. That way you aren’t hit with unexpected costs right before the start of school. If you want to get ahead of the curve for next year, keep an eye out for clearance specials once 2015’s back to school rush ends. You can stock up on all the basic supplies (pencils, folders, paper etc.) so you only have to buy a few things the following year. According to the National Retail Federation, the average family with school-aged kids expects it will spend $630.36 this year on back to school needs. College age kids are expected to spend an average of $899.18. Across all shoppers, clothing and electronics account for more than $400 of the average family’s back-to-school outlay. Avoid expensive “luxury” school supplies that aren’t necessary. Glitter pens and a brand new pair of scissors every year might be an area where you could cut frivolous spending. Prioritize which items you need right away at the start of the school year and which ones you can price watch throughout the year. Do your kids want a new iPad so badly that they just simply cannot live without it? Encourage them to save their summer spending money, take on additional chores or find other ways to make some extra cash so when fall time comes, they can buy those hot ticket items. The fact that they bought the special school supplies or electronics with their own money will teach them the value of hard work and to take care of the things they work hard for. Prepare your kids for the fact that they may not be able to pick and choose every item on the list, and that some supplies are more important than others. Checking your student’s specific classroom supply list will help determine what items you need to buy, but it’s important to remember that every age is different and may require specific supplies. It may also be the school (or teacher’s) rules that certain items aren’t allowed. Tots and teens may require more supplies to start a school year, but it’s the college age shoppers that bring in the most business for retailers. From dorm room furnishings to cleaning supplies, the expenses can really add up for those leaving home for the first time. Use this sample Back to School Shopping List to give you an idea of what you need to purchase this year. Don’t be afraid to buy school supplies online, where you can take advantage of comparison shopping and free shipping offers. Websites such as Amazon.com and OfficeDepot.com have convenient age group and local school-specific shopping lists available to help you quickly find and buy the required supplies. Busy parents can also take advantage of perks like reserving online and same day delivery, avoiding the stress of dragging their kids to the office supply store. Lastly, when in doubt, ask the teachers! You may think that you’re bothering them, but they will likely be much happier that you checked beforehand to avoid the hassle of requesting replacement school supplies at the beginning of the year. Keep in mind that these supplies may not last the entire year, so set aside an inventory of pens and other basics to have on hand, and be prepared for new “necessary” supplies to pop up throughout the year. With a little preparation you can be on your way to a successful school year!